Hangzhou Hidea Power Machinery Co., Ltd. (Hereinafter called Hidea) , located in Hangzhou of China, is one of the most professional manufacturer in outboard motors. It is a high-tech enterprise which integrates R&D, manufacturing and marketing with its own professional team. The annual production capacity reaches 100,000 units. Hidea owns R&D center, advanced production line, strict testing system and high-efficiency after-sales service system. It cooperates with China First Auto Works Corp. (FAW), who provides strong capital and technological support. Hidea was approved by ISO9001 international quality system, and won many hornors by its excellent performance & steady quality, such as CE, EPA and VCA certificates. Hidea outboard motors include four-stroke series and two-stroke series. We are one of the most professional manufacturer in outboard motors. Our brand Hidea are the first in CHINA, approved by ISO9001 international quality system, won many honors by its excellent performance & steady quality, as CE, EPA and VCA certificates. 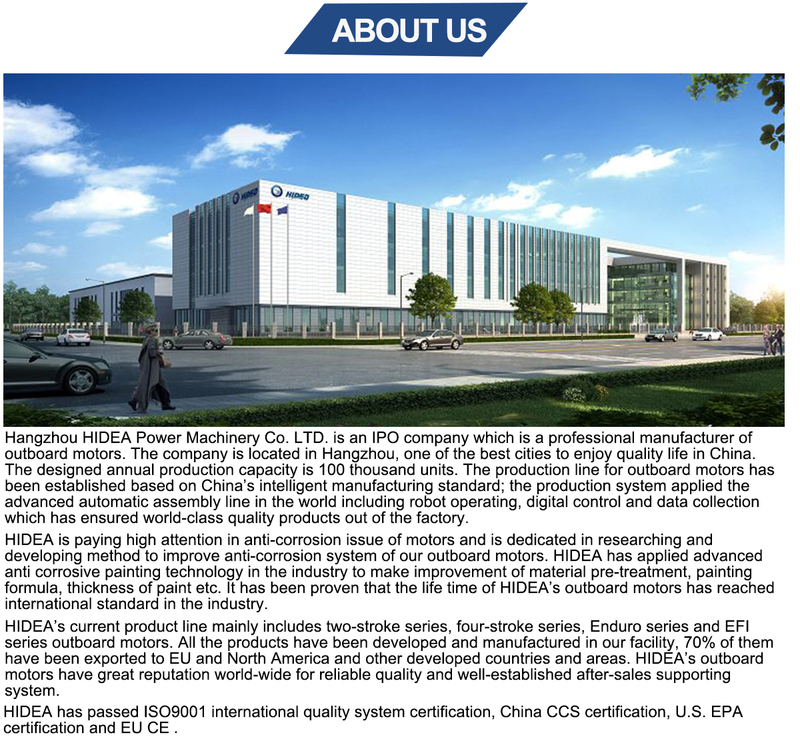 Hangzhou Hidea Power Machinery Co., Ltd. (Hereinafter called Hidea) , located in Hangzhou of China, is one of the most professional manufacturer in outboard motors. 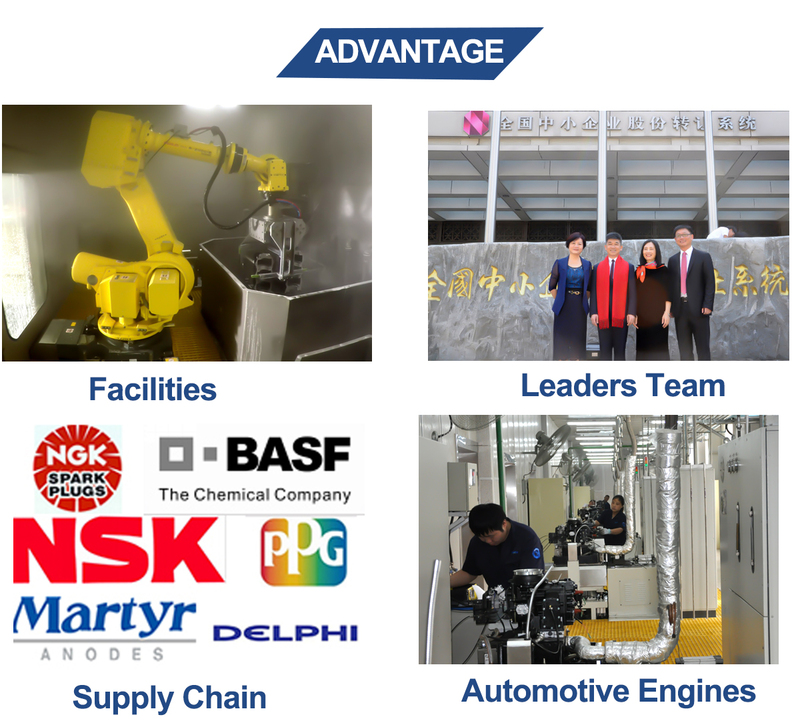 It is a high-tech enterprise which integrates R&D, manufacturing and marketing with its own professional team. The annual production capacity reaches 100,000 units. Hidea owns R&D center, advanced production line, strict testing system and high-efficiency after-sales service system. It cooperates with China First Auto Works Corp. (FAW), who provides strong capital and technological support. 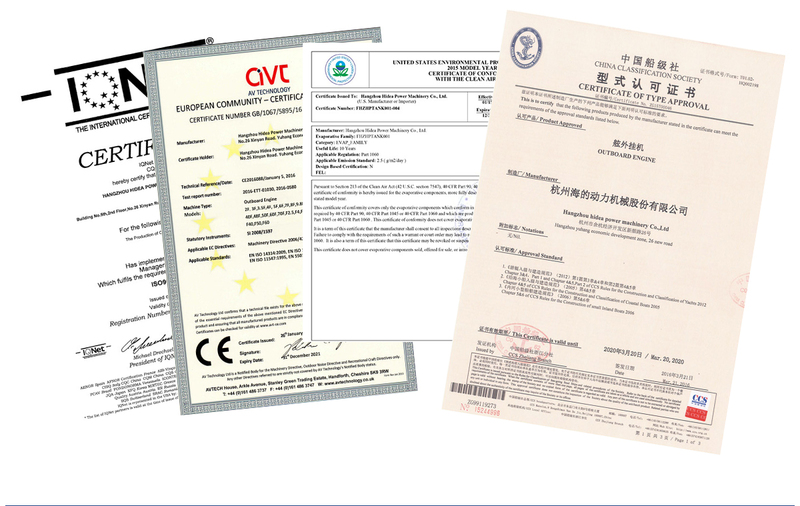 Hidea was approved by ISO9001 international quality system, and won many hornors by its excellent performance & steady quality, such as CE, EPA and VCA certificates. 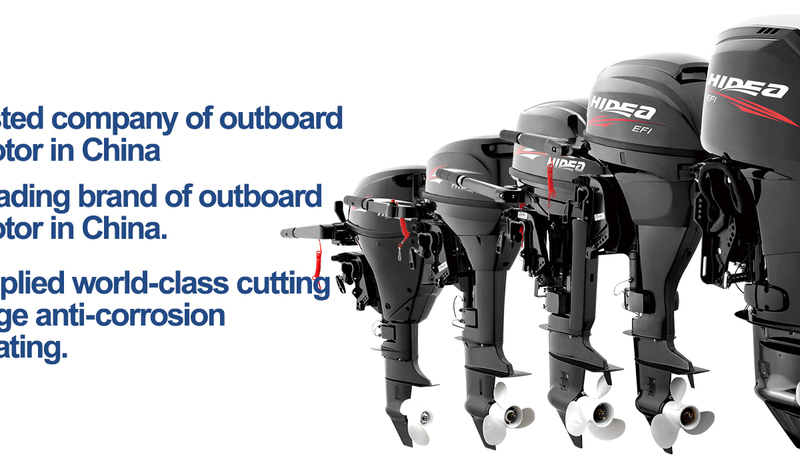 Hidea outboard motors include four-stroke series and two-stroke series. It's an export-oriented enterprise, the products are spreading North America, South America, West Europe, East Europe, Africa and Aisa Pacific countries, such as America, Brazil, Argentina,Australia,Sweden,the Netherlands,Italy, Russia, etc. With the concepts of integrity, confidence, observant and innovation, Hidea concentrates on researching and producing environmentally friendly products, tries its best to provide better life for humanity. Hidea sincerely welcomes corporations and personalities from all of the world to establish partnership and create a promising future. For passion, at the exciting moment. For love, in the precious memories. Enjoy quality, enjoy life!